Traveling with you toddler doesn’t have to be difficult. With some simple planning and a bit of ingenuity, taking your little one on a car, train, bus or plane can actually be an enjoyable experience. As someone who’s ever traveled with toddlers can tell you, it’s much interesting to discover the world with children. They’re curious, fun, and extremely enthusiastic. This little guide will hopefully help both of you enjoy your trip. Although it might be tempting to take the entire toy box just in case, this strategy will seriously weigh you down. Imagine running through a busy airport the day before Thanksgiving toting your toddler, a stroller, a few suitcases and a garbage bag sized sack of stuffies, building blocks, crayons, dolls and more. Instead of taking it all, ask your child to choose a few favorites for your trip. If your child sleeps with the same stuffed bear every night, it’s an absolute must for soothing and transition times. Try to settle on toys that are engaging, have multiple uses and will not annoy other travelers. For example, your toddler may get hours of play out of her talking Dora doll or his favorite superhero, but the passengers around your child on a four-hour flight will not take as much pleasure in the constant noise. Car color match: Your two-year-old may be just beginning to learn the color names at home or in a preschool program. Help your little one to improve their color recognition skills by looking for specific shades and hues passing by on a long car or bus trip. Choose a color such as red or blue and ask them to say the color word each time they see a new car that matches. Counting games: Counting is one of the easiest ways to the pass the time. Create your own game on the spot based on whatever you see. If you are looking out the window of a train, ask your little one to count the trees that go by. Likewise, you can count items in the interior. Count how many people are in your row during an airplane trip or how many different colors are on the inside of a bus. Movement games: Your toddler may not be able to get up and run around during a long plane ride, but they can still stretch their legs playing a few seated movement games. Ask your child to touch their toes, clap their hands or wave to the birds that they see outside of the window to release a little bit of pent up energy. 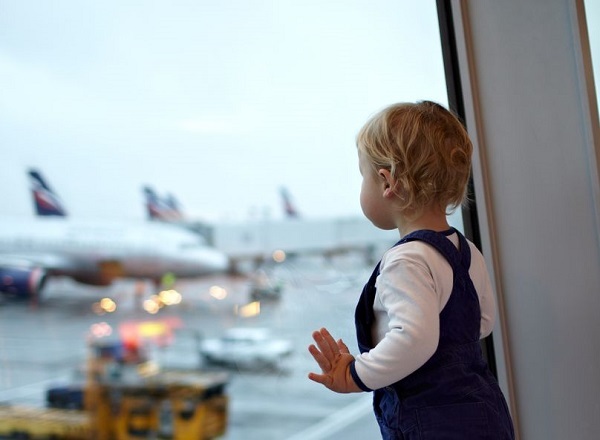 Cut down on the challenges that traveling with your toddler presents by planning ahead. Pack only the toys that they will need, making sure to pick ones that are truly necessary. Create a few travel games to pass the time and be ready with some quiet time activities for calming and soothing your sleepy child.